Many years ago, when I was young and a church goer (there is nothing wrong with church attendance, so please don't get all offended) there was a guy telling us about how he had come to Christianity and how it had changed his life for the better. Anyway, when he was 16 he had left school and gained an apprenticeship with the Hughes Tool Company here in Belfast. Being young, he thought that the firm was called Huge Tools and that he would be engaged in making enormous spanners and screwdrivers. For some reason this came back to me the other night, after a gap of 30 years or so, and I had a good laugh to myself about it, leading to the mrs asking me to stop sniggering. Then it occured to me that this would be a rather fine idea for a micro layout, steel in, giant spanners out. obviously for the giants who built the causeway. Well, I worked on some Dredges , the pumps had a 45' Housing diameter and the nut holding the impeller was about 18 to 20 inches. could be a fun project. Chris, do you have any photos of that stuff? Chris - I'd not mind a look at some of that kit if you have any photos or links. I'm going to clear the decks a little and actually finish something before I start this one, so it may be a bit of a slow burner for a while. I'm thinking of slightly bigger than micro size, perhaps 4' x 18" in Gn15, with sector plates in buildings at either end in lieu of points, possibly on a couple of levels I've an idea to adapt the hard disk spindle turntable idea I used on the cat litter mine to make a very smooth sector plate, helped by the big box of them in work. Project X is taking a lot of time at present, and will be revealed when its done, as it will hopefully cause a few laughs. Due to not sleeping too well this idea has progressed a little further in my head. I'm thinking of extending to 5', probably over two boards, with a tall thin building at the back to hide a storage siding running the length of the layout into a sector plate at either end inside deeper buildings. The open front area is undecided, but may well feature a quayside and possibly a swing bridge. All of this is still speculative, but keeps me from watching dreadful middle of the night TV. Been a while since I've given this one much consideration, but "Project X" is due to be finished in the next 20 days (this time in 3 weeks I'll hopefully have finished the setup for its first outing and be home again) so I'm thinking "what next..". The cat litter mine is well under way, and won't take much to finish (half a year or so or going easy), and the heretical N gauge project is taking good shape too. 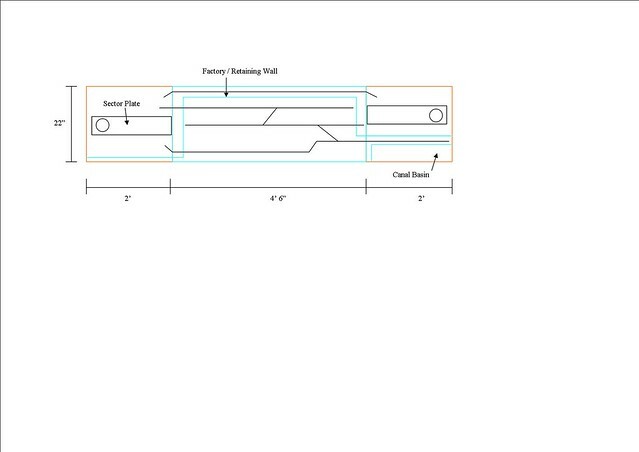 It comes in at 8' 6" over three boards when assembled, with hidden sector plates at each end behind either tallish retaining walls or factory wall extensions. There is a fiddle yard / sneaky train movement track at the back behind the main factory building. The operation sequence will be steel coil / coal / tanker traffic / vans inwards, and assembled giant tools (mainly spanners with the odd socket) out. The idea is that shipyards need enormous spanners to tighten the nuts on propellors and triple expansion engines, and this is where they are made. Would the assembled Gnatterboxers please take a moment if at all possible and run an eye over the hastily produced track plan? I'm going to post this on the Narrow Gauge Forum as well, just for giggles. Last edited by lesmond on Wed Jul 05, 2017 8:13 pm, edited 1 time in total. I like this. I think it will make a great layout. The two sector plates are a great idea, adding much scope for operation while minimising layout length. I think this will give a great impression of a busy industrial complex. Interesting plan Les. You might consider having the front track not go to the sector plate at one or both ends, but extend to the end of the layout and be visible. To get more length of track for your buck. Geoff - thank you, hopefully I can do it justice. Construction will hopefully start in the summer. Peter - liking that idea, thank you. That would definitely lead to a bit more of a run and also add a interest to the front. I'll redraft and post it. I've moved the right hand wall back, extended the track on that side, and added a canal basin for some extra interest and detail. If ground level is the 4" or so above plywood level, this should add depth as well as a bit of height. There may well be a bridged culvert or pipe run somewhere else on the scene. I saw similar earlier while out and about, so will have to return to take some photographs for reference. The lower track has had a dogleg added, and the middle track now stops at the left hand wall, but continues on to the right hand sector plate at that end. With the correct electrical setup allowing two locomotives to run at once, this could lead to a busy scene with lots of coming and going. Last edited by lesmond on Wed Jul 05, 2017 8:16 pm, edited 1 time in total. Hi Les, that's more interesting and I like how you've raised the track level. 1 - Trains arriving from the left sector plate on the second to top track need to reverse through the crossover to reach the lower tracks. Similarly, trains arriving from the right sector plate on the third to top track need to reverse through the crossover to reach the bottom track. Depending on how you will operate this, this need to reverse might become tedious. If you reversed one or both crossovers then you wouldn't need to reverse like that. 2 - Now the two middle tracks each connect to a sector plate and have a dead end. 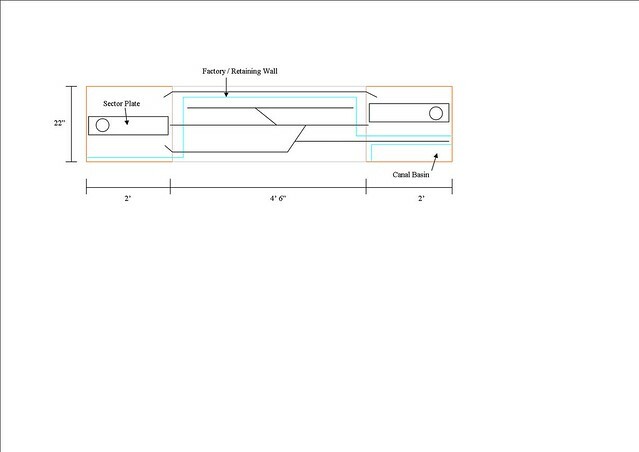 If the third to top track connected to a sector plate at both ends then it would be like a through line. And if the second to top track had a dead end at both ends it would be like a siding, to load/unload wagons or just to store wagons. A bit of depth and height makes all the difference to a model (I reckon, anyway) and using foam as "ground" makes it very easy. Last edited by lesmond on Wed Jul 05, 2017 8:17 pm, edited 1 time in total. This one has taken a bit of an unexpected jump forward, as I've found and stashed away two good bits (one 4' x 4', one slightly smaller) of 12mm ply from various scrap piles around where I work. These will give me sufficient to make the baseboard without actually spending any money (a good thing). I like making things out of wood, and with the aid of a neighbour at work who has a big table saw (they make kitchens) will devise a cutting list. 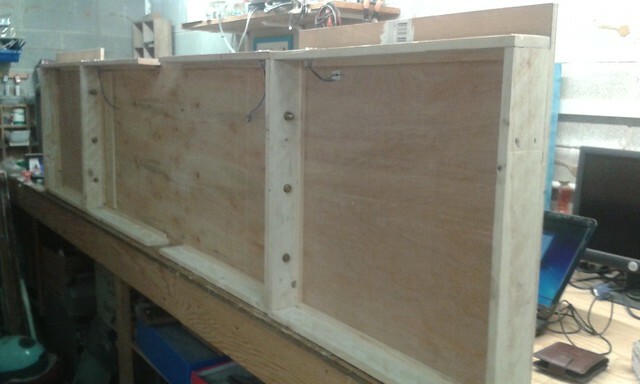 I'm thinking of three upside down boxes, with a depth to the ply of 3" or so, to allow for wiring, speakers etc. The two end pieces will need to be carefully thought out, as the middle section will have a further 3" or so of foam on top to come up to ground level and allow a scale 5' 6" or so drop to the surface of the water in the canal basin. As the left hand end is basically a sector plate with a wall in front of it and very little scenery - perhaps 1" deep at the front - I'll have to calculate heights very carefully to allow sufficient depth for the sector plate pivot to be firmly mounted while remaining flush with the track ends from the centre section. The right hand end will be another matter altogether, and I've not got my head around it yet! I'll take some time over the weekend and draw it. 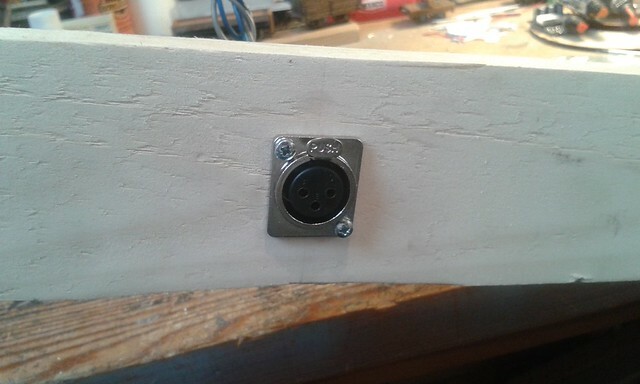 Power will need to transfer from the centre to the end boards, but I've a plan for that using 3 pin XLR connectors (mainly 'cos I have some and they'll fit in with everything else). Down to work this morning for a bit (mainly to feed the cats) so I've had a look at all the current stock of materials. There's also a good haul of foamcore which a client who makes signs kept for me as offcuts. I reckon this will make the factory and surrounding walls, and also the sides of the canal with plenty of added detail and texture. Also yellow and pink extruded foam in abundance as I can't pass a skip with it in it . As the track will be mainly buried under concrete or earth anything 16.5mm will do nicely. Again, plenty of Peco flexitrack about the place. I'm going to use scrap hard disk drive motors for the pivots of the sector plates. These will be manually operated. Much design is needed there for latching etc. Rolling stock will mainly be much converted Hornby short 4 wheel wagon with a bit of serious kitbashing for the bolsters to carry the spanners. I've a good stash of those and an upcoming show to buy a few more from the second hand stall if needed. What I will need are four points as I don't fancy making those just yet, but if that is the major expense (apart from locomotives which can also be used elsewhere) then this could be a very economical model indeed. Electrics will be to my standard system, I've a few controllers made, and will work the points with servos via MERG modules (cheap and reliable). Right then.. 50 weeks to do something with this for next years NDMRS show. The railings at the top on one side are damaged, but thats it. I've also been thinking about operation, and think that two control positions might be in order. One will operate the backstage area - both sector plates, and the line behind the wall - from the back, and the other will take care of the through line (although there may be joint, switchable control), shunting and the canal basin from the front. As control is to be DC, this will lead to lots of lovely wiring I don't like to have to peer over a layout to see what is going on, and am also too old to stand all day. 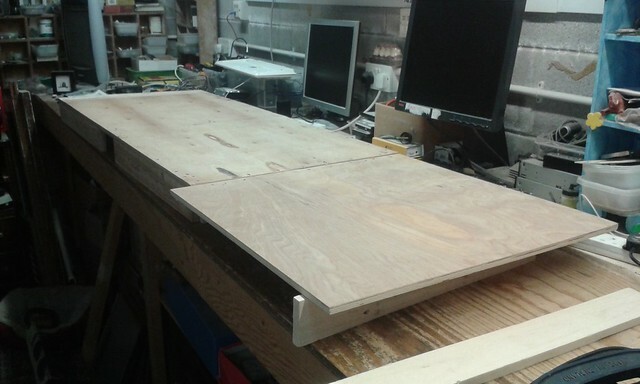 All plywood for the three boards is now in stock, so measuring and cutting can start soon. I've also checked that a 4' 6" board will fit into my wee van, and it will. Last edited by lesmond on Wed Jul 05, 2017 8:21 pm, edited 1 time in total. 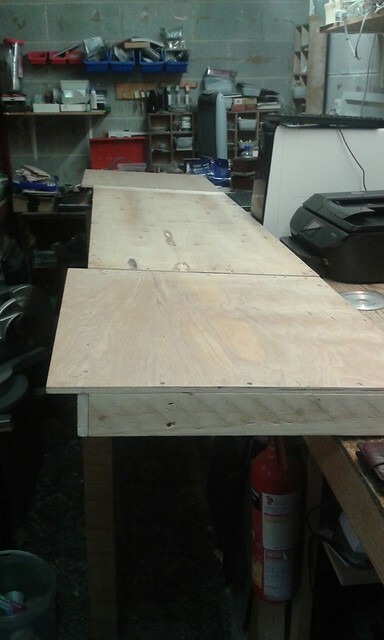 The first lot of ply is cut (thank you, John) so we now have the main section and what probably will be the ends for it. Overall length has reduced to 4' 4" due to the strip left over after reduction to 22" being 4" wide, and 4' 8" being just too long to fit my wee van. Depth below the base to hide the wiring, speakers etc is 3 1/8", mainly due to a slight measuring error (it was meant to be 3"). 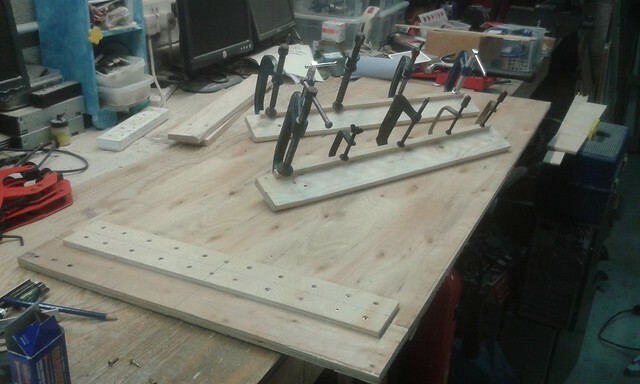 There is only enough ply from another bit to make three matching ends instead of the four I need (two for the centre board, two for the inside ends of the sector plate boards) to bolt the three sections together, so I'll find something else for that job. I'm also trying to devise a way for one panel to lock the other out of the shared sections of track. Relays are the current thinking, but the idea is very unformed and will probably be revised. The bits are mostly in to make a fireless crane tank. This (if it works) will certainly be novel. That's about it for now. Slow progress but I find it best to think a lot before cutting too much timber. Right then.. Sunday more or less to myself.. what to do? Sleep? - just done that. Watch TV? - nope. Take drink? - not in the mood. Ah-ha!! - lets start the baseboard for Huge Tools seeing I've to go to work anway for kitten duties. So that is what I did. I found a long pallet in a local skip last week, it has provided four 8' lengths of 3" x 1/2" ply, which needed to be de-nailed and sanded. No problem there, and just enough for the underframing of all three boards with a very little left over. 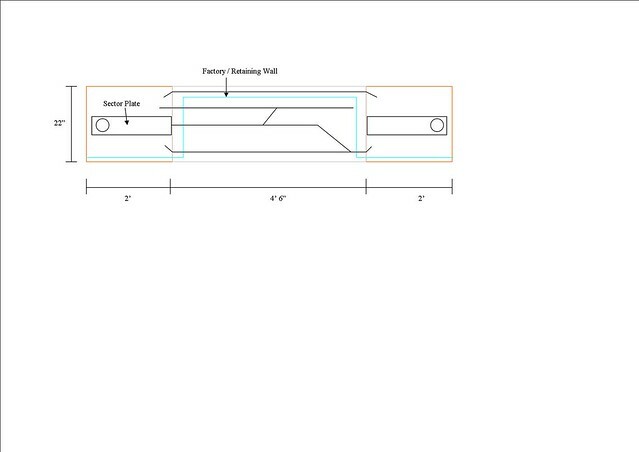 Next some measuring, a very rough diagram and some thinking. The whole thing is 8' 4" long, the main board is 4' 4". I decided to make the ends and sides for the main board first, mainly because I have the ply for the top and not for the other two. 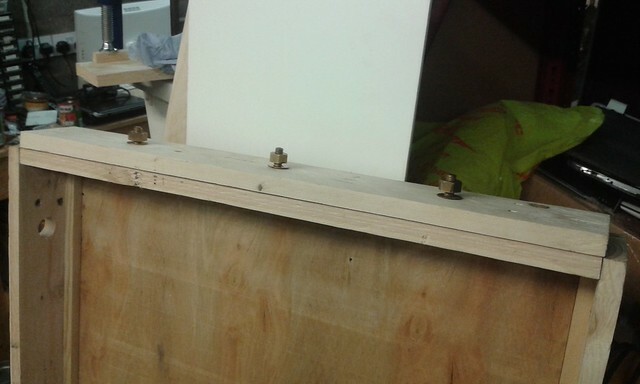 which is the main section with both bits of ply screwed / glued together. One is 4' x 22", the other 4" x 22" to give the required length. 4' 4" fits the back of my wee van with an inch to spare at either end, which is why its the length it is. 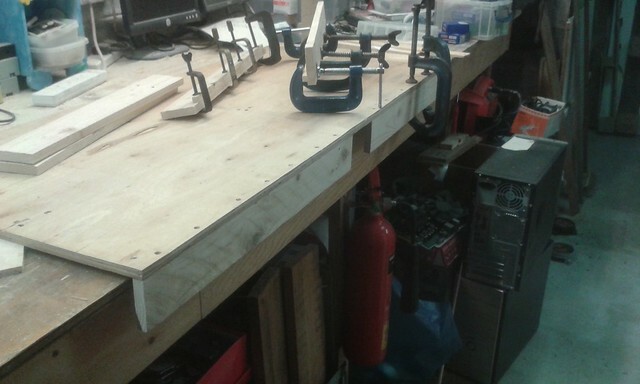 The bits on the top clamped are the front sides made from reclaimed pallet, with a 1cm square piece glued on to the back edge to give some strength, alignment and also something for the screws to bite into when it is fitted. There is a 4" gap in the front at the centre to recess the connectors for the front controller and panel into to save damage in transit. There will be a 6" gap at the back as more will be connected there, out of sight. There will also be 2 three pin XLR sockets mounted into the rear pieces to carry the current to the two extension boards. 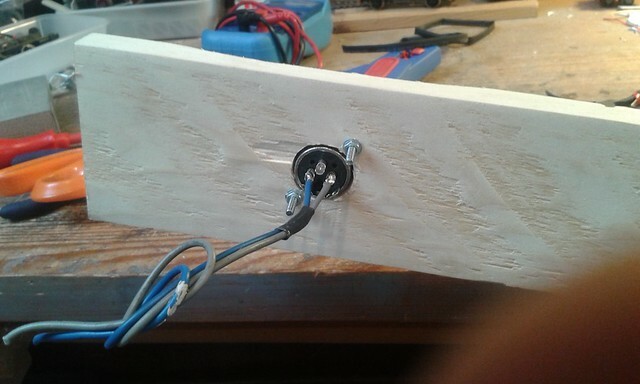 As there are no points etc on the extensions, all that is needed is the output from the controllers to them, so this makes the wiring quite simple. I'll make two short jump cables for this job. That's it for today - off home soon, possibly for another look at the fireless crane. Last edited by lesmond on Wed Jul 05, 2017 8:23 pm, edited 1 time in total. Last edited by lesmond on Wed Jul 05, 2017 8:24 pm, edited 2 times in total. After a bit of an hiatus (work very busy / skint) I've bitten the bullet and bought ply for the two sector plate boards. Another very busy week ahead in work, so I'll all being well get them framed and in place next weekend, and hopefully a start made at the trestles. I've liberated a suitable pallet to make them from, so at least there won't be a lot of outlay. Now to finish this board, make the next one, then make a start at the trestles.